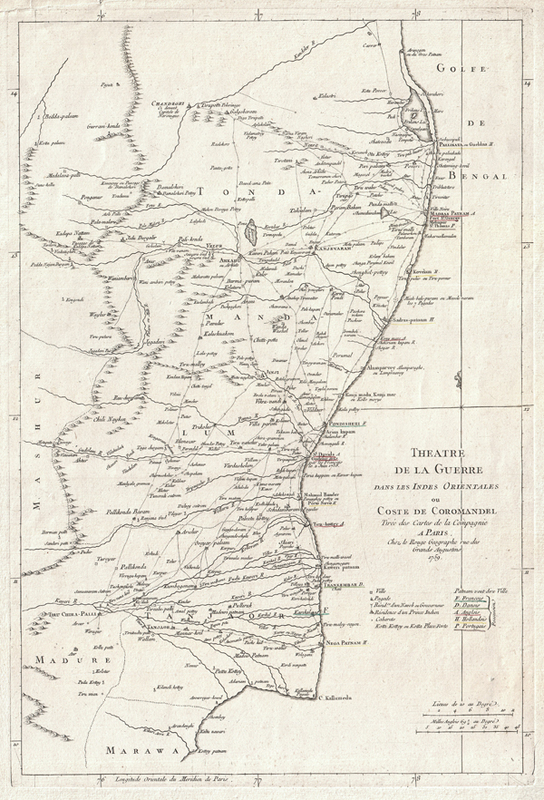 This is an attractive 1759 map of Eastern India or Coromandel by George-Louis le Rouge. Covers the Indian coast from Marawa, in the south, northward past Pondicherry and Madras as far as Pallikata on the Bay of Bengal. Extends inland as far as Mashur. Offers wonderful inland detail of both roads and river systems. Designed to illustrate the then raging struggle by the various colonial powers to control the rich Indian trade. Ports are underlined and color coded to signify the colonial empire that controlled them. French possessions, including Pondicherry, are in green, Denmark is dark green, England is red, Holland is yellow and Portugal, gray. Prepared for issue as plate 151 in Le Rouge's Atlas General. George-Louis Le Rouge (c. 1712 - 1780) was a Paris based map publisher operating in the middle part of the 18th century. Le Rouge was born in Hanover Germany as Georg Ludwig, where he was educated and employed as a military engineer and surveyor. Around 1740 Le Rouge moved to Paris, Francophied his name, and set up shop on the Rue Des Grands Augustins as an engraver, book publisher and map publisher. Despite being born German and adopting Paris as his home, Le Rouge was an ardent Anglophile and spent much of his time translating English books and maps into French. Much of his cartographic work was based upon English maps. During his active period of roughly forty years Le Rouge produced thousands of maps and diagrams ranging from city and town plans, to atlases, plans of military campaigns and sea charts. He was awarded by his diligence with the title "Geographe du Roi". Le Rouge also worked with Benjamin Franklin to produce the important 1769 Franklin/Folger Map of the Gulf Stream. Franklin, who met Le Rouge in Paris, writes that "He [Le Rouge] is, I believe, a proper person." Le Rouge Cohn, Ellen R., Benjamin Franklin, Georges-Louis Le Rouge and the Franklin/Folger Chart of the Gulf Stream, Imago Mundi, Vol. 52, (2000), pp. 124-142. Oehme, R. (University of Freiburg im Breisgau) A French World Atlas of the 18th Century: The Atlas General of G. L. Le Rouge., page 64.